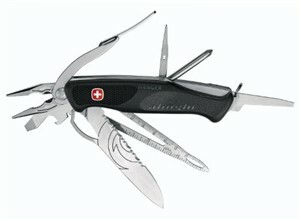 Wenger designed the Alinghi for use on yachts, but any outdoorsman would find this knife handy. The mechanics tools include large and small locking flat-blade screwdrivers, a pair of needle-nose pliers, and a Phillips screwdriver blade. That's enough to solve many common gear problems. Unless you work with rope, you may be mystified by the shape of the English and metric ruler, which doubles as a marlinspike for loosening stubborn knots. The unusual spike design looks fragile, but the tempered stainless steel handles most jobs well. The pliers on the Wenger Alinghi qualify as light duty, and unless you're wearing gloves, you'll find the grip pressure limited by your own pain threshold. The slim steel handle of these pliers isn't something you'll find comfortable over the long term, but it certainly will come in handy for small jobs. The body of the knife provides a much better grip with a tacky nonslip surface you'll find easy to hold in wet weather and a shape that prevents slipping even when hands are cold and clumsy. The Alinghi's 3.9-inch high carbon stainless steel main blade features a generous serrated cutting edge with the front half plain edged for fine work. The knife is designed for one-handed operation in either hand. Swing the main blade out with thumb pressure on the blade's steel loop. The blade locks automatically in the working position, and unlocks with thumb pressure on the button lock. Closing the knife one-handed is also safe and simple, and the 5.1-inch knife stores easily in its nylon belt pouch. For a simpler rigging knife, see the Myerchin B300.